It was not the most academic course in the world, but for twenty five years I ran the best horticultural course at Askham Bryan College. Had I been a student, I would have failed! I would have not survived my first machinery practical class! I have absolutely no motor skills whatsoever. My handwriting is indecipherable. My spatial sense is minimal. My do-it-yourself skills are abysmal. My friends know these things and recently bought me a book entitled ‘Bodge it yourself’. For me, it is sheer purgatory doing anything that might be described as handy. I am completely incapable of following a set of written instructions. Putting together a flat-pack is completely beyond my ken. Even things like mending a puncture - especially mending a puncture - stress me more than you can imagine. I have given up trying! I therefore look up to any engineer as a kind of god-like figure. Harry next door is king. Not only can he fix anything, he can immediately work out how any new piece of machinery or equipment works just by looking at it. From the humblest of tasks, fixing my knapsack sprayer, to installing a nuclear power station, he’s your man. Were it not for his help, our house would long ago have fallen down. Mind you, not many engineers are good gardeners. I describe the pruning skills of another dear engineering friend as ‘engineers pruning’. He prunes like he plants - in straight lines! A disclaimer here, if you are reading this post, Harry-in-Preston, it’s not you! We are an endless source of amusement to Harry and Cathi. I can hear in my head the gales of laughter from next door when he regales Cathi with our latest escapade when she comes home. He recently despaired when he saw me installing vine eyes when wiring my wall. Apparently I was drilling with such gusto that I melted the bit. And our rawl-plugs never seem to fit! On another occasion, Harry dined out for months on the story of my suggestion we could cut the wall beading with secateurs. Felco secateurs are very versatile! 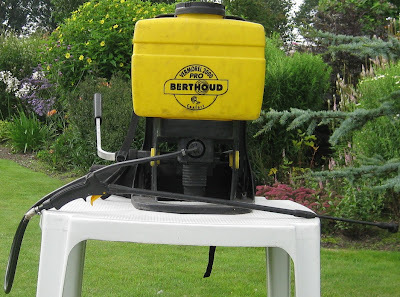 Last week, my Berthoud knapsack sprayer developed a leak. Not surprising, after five hundred hours of use over five years. A tiny jet of water emerged from a joint. I now know the relevant part to be BPTA 2430, apparently called a ‘trigger assembly’. 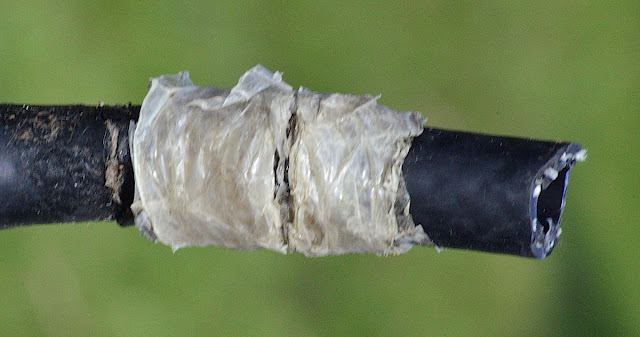 My sprayer hose was already wrapped with cellotape! With constant bending, the hose had threatened to burst and the cellotape was there to stiffen it. Last time round, Harry had cured the problem in two minutes flat. He had clipped off the half inch of damage at the end of the hose, and in seconds fixed it back with a handy jubilee clip. Job done. It would have taken me days. What should I do with this new leak? Would some kind of tape or sealant do? Perhaps I should replace part BPTA, but the present one seemed to be stuck on! I could buy a new sprayer, but evenly heavily discounted, it was £130. Worse, horror of horrors, it comes in a kind of flatpack, although I’m not sure how you can manage to flatten a tank! Harry is always amazingly tolerant, generous, and helpful when we have a problem. But I do feel a little guilty every time we ask for his rescue. 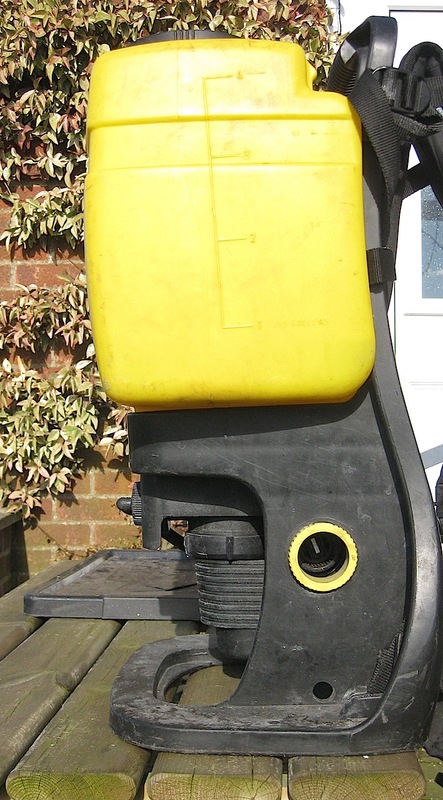 But clearly I needed his help, so I dragged my half filled sprayer through his narrow gate and knocked on his door. There was no answer. Perhaps he was hiding? On returning home I wrapped the leak with cellotape, with the intention of using the sprayer. I leant over to pump the sprayer, which was standing on the garage floor, to test that my cellotape worked. The handle was not there! It must have dropped out! I quickly retraced my steps but could not find it. In disbelief, I returned to re-examine my sprayer. The pump handle had never gone, it’s just fitted on the other side to where I thought it was! With relief I pumped it. Thank goodness Harry had not witnessed my latest act of stupidity! Water spewed out from both ends of part BPTA 2430! Two hours later there was a knock on the door. It was Harry. Apparently a man from the village had e-mailed him to say that when he had driven by, there was a strange man in his garden. Harry immediately came round to our house! We plied him with coffee. He looked at the sprayer and without comment removed the cellotape. With ease, he detached the stuck part BPTA, and was astonished to find that there was no seal. That’s a washer or something. I swore I had not detached the part for at least eighteen months. Then he spotted the seal - it was in the wrong place! Don’t ask! He then noticed the completely blocked filter! It appears that all filters of this type work in essentially the same way and are perforated. Without glasses, this was news to me, as was the fact that the filter tube was blocked. I won’t attempt to relate how I thought I had previously cleaned it! It must have been some kind of miracle that the sprayer had worked at all. There was a slight blip in his progress when he asked me to clear the filter, but I eventually mastered this difficult task. It was only because you can never find any tools in our house, that the whole job took longer than fifteen minutes. Harry checked the repair by pressurizing the diaphragm. He pumped much harder than I ever do. I hope engineers don’t spray with glyphosate at such a high pressure! For the type of spot spraying I do, it would drift everywhere and kill my plants. Bodge Extraordinaire! Pic posted by Cathi next door! My husband is a civil engineer - do you count then as useless in the garden too - if so I'd better not tell him! Oh let him read it. Some engineers are excellent gardeners. Even some farmers have lovely gardens! Being a foot taller than me I have no choice other than to look up to him, but godlike ... ? What Roger didn't mention is that the fine looking jubilee clip pictured above, only cost a modest 99p online. Postage, however, to Brenda's absolute horror, cost an eye-watering £8.99!!!!!! To add insult to injury, the self same clip at the local hardware store, would have cost only 33p plus a short 6 mile round trip! You and Brenda tell porkies or have a very defective and selective memory! Delivery was £5.99 AND it was a pack of 12. I was proud of the bodge posted by Cathi, it gave me an extra 35 user hours. Please don't tell them about my escapades with my camera! That's wishful thinking - £5.99!!! Not only that, they were cheap Chinese cr@p! For that price, you could have got proper stainless steel! I haven't laughed out loud at a blog before! I did with this one! Pleased to tickle your funny bone Mark! I am so lucky to have a handy husband, he is for all the technical things around the house, but gardening no that's not his cup of tea. He just likes to sit in the garden reading a book on Sundays in summer. Brenda's former husband was handy, but she says she had to nag him to get things done. She far prefers me, she can make a long list and get a man in! Man????? I think Brenda means next door! You do much more than your share! What fun! One of your best posts Roger. Loved reading it. What a laugh. Harry must have the patience of a saint! He does, but we have been known to bang the table at each other! I have a brother-in-law who is handy, Brenda often has a little list for Dave when he comes up from the South (but he is not perfect - he digs and rotavates his allotment). A study in self deprecation! I loved it. Don't envy Harry though! Seriously, great post. I've forwarded it on to my brother-in-law in Australia who will definitely see the similarities! Was a bit worried, after the lawn post, that you had lost your sense of humor! I got a little uptight with the suggestion that I am unkind to worms! Ahhh. And there I was, thinking it was Jeanette's suggestion that you may have feet of clay! To be fair though, many Northern hemisphere chaps do when it comes to their lawns! In the Southern hemisphere where they're brown half the year, there's not much point! I feel your pain. I too am completely unhandy when it comes to fixing any kind of equipment. I suspected I might not be quite on my own! Laughed out loud! Then forwarded it on to everyone who will recognise themselves! Have to agree with Grant Penna - good to see you back on form! I could do with a Harry too! Do you think I could hire him out? great to hear from you again Poppy! I have never seen a bodge QUITE that bad! That's one of my better bodges! Superb post Roger. I also laughed out loud. I can just imagine poor Harry hiding from you if he sees you bringing round stuff to fix! I do Colin! But he always finds me, even when I'm lurking in my workshop, or even in the chicken house!